Have a question for Davinci Resortel? If what you're looking for is a conveniently located hotel in Gangneung-si, look no further than Davinci Resortel. From here, guests can enjoy easy access to all that the lively city has to offer. 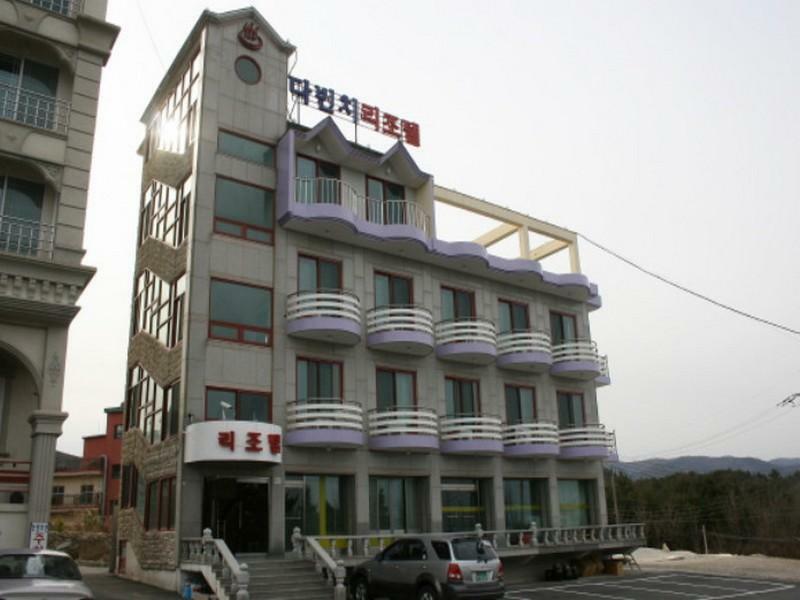 This modern hotel is in the vicinity of popular city attractions such as Jeongdongjin Sunrise Park, Jeongdongjin Beach, Wangsan Johyung Yonguso. At Davinci Resortel, the excellent service and superior facilities make for an unforgettable stay. A selection of top-class facilities such as free Wi-Fi in all rooms, daily housekeeping, 24-hour front desk, express check-in/check-out, car park can be enjoyed at the hotel. Davinci Resortel is home to 22 bedrooms. All are tastefully furnished and many even provide such comforts as television LCD/plasma screen, non smoking rooms, air conditioning, heating, desk. The hotel offers an excellent variety of recreational facilities, including garden. Enjoy unparalleled services and a truly prestigious address at the Davinci Resortel. We caught a taxi from Jongdongjin train station to Devinci. It is too far to walk from the station with luggage (took at least 30 min to walk without luggage). There is no wifi in the room, so they moved us to a room with a computer in Korean(worked out that if we go to Google Australia can access information we needed in English). They don't speak any English, so difficult to communicate even with translator app. The bathroom sink leaked a lot, so we had to clean teeth and wash hands in kitchen sink. Only 1 large plate in kitchen, but several small bowls. Gas stove worked ok. Cable TV not many English channels. AC worked ok. The shower was over the toilet from the basin, so the whole bathroom floor got wet when we had a shower. Had free hot and cold water dispenser, and microwave in the hall Could hear the sound of sea gulls and fog horns from Sun cruise resort all day, got sick of it after 2 days. Went to Sun Cruise resort for dinner on the first night, expensive but nice food, and beautiful views. But other than that no other place to get food (or even 7/11) near Devinci. No sea views, only trees across the road and the ship on the cliff of Sun Cruies. We moved after the 2 nights we had booked to a nice place with ocean views close to the beach and shops and restaurants for much less money, only W40,000/nt. We just asked at a few of the many hotels along the beach. View of Sun Cruise Resort and beaches, adequate kitchen facilities, only a few rooms in the resort so not very crowded. Our stay at the Davinci Resortel was great. Rooms were exactly like those advertised with bedroom, kitchen/dining, and bathroom. Booked during the summer vacation time but it didn't feel busy or crowded in the resortel section which is separate from the hotel building next door. Kitchen was nice to have for the three days we were there so we could cook our own meals and not eat out every meal at a Korean restaurant. Kitchen had a pot and frypan for cooking but only a few utensils (spoons and chopsticks) and tiny bowls (only on large dinner sized plate) for eating. For Koreans it would be more than adequate. View out the windows overlooked the Sun Cruise Resort (giant cruise ship on a clifftop) but during the daytime the ship resort plays an endless soundtrack of seagulls and ship foghorns from dawn till dusk so after three days it gets a little annoying to listen to. The staffs are very kind and helpful. Although they don't know much English, they've tried their best to solve our problems. We asked him to recommend a restaurant to eat Tofu, he directly drive us there! Very grateful for their dedication!! The location is also very nice. We were at 7th floor and can see the whole town and the sun cruise. The sea is also very great!! Without a car, the hotel is not the easiest place to get to. But the weekday price is not bad for the ocean view (although partial) and being able to see the sunrise from the room was nice (can also go on the building's rooftop). Check in was super fast. The wifi was so weak it was pretty much useless and the room was cold and we were not able to adjust heating from the room. There are scores of cheap places near the train station, but this place has one of the better views in town. the room was great, it was clean and well-decorated with everything that we need (other than the normal amenities and toiletries, body lotion, hair gel and comb was also provided!). 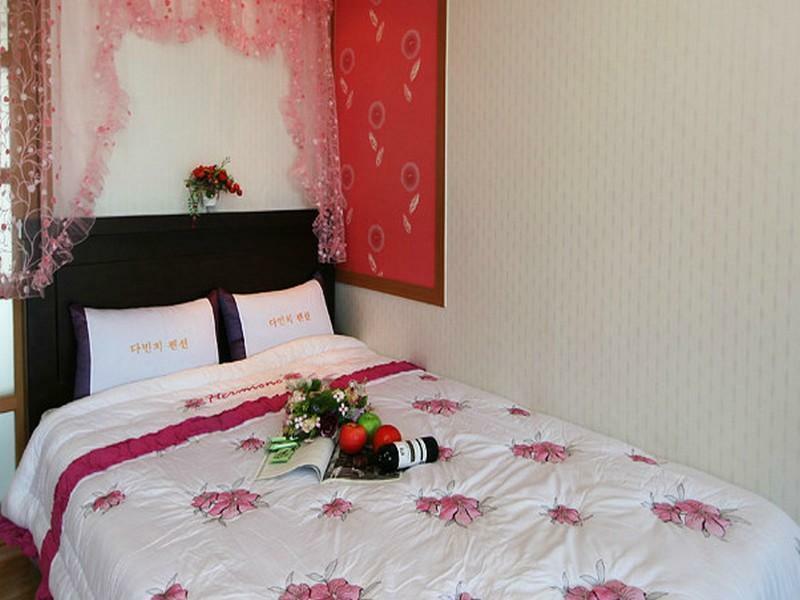 the hotel was not too far from Jungdongjin train station and close to the Sea Cruise hotel. However the hotel was located on top of a hill and taxis are difficult to get at that area. We walked up the hill with all our luggages and almost broke our legs! Luckily on our way back, the staff (or the owner I guess) was kind enough to give us a lift to the train station. No WIFI in the room, only at the lobby (but there aren't any sofas or chairs at the "lobby", you will just have to stand there while you are surfing the net on your phone). The location is far uphill so not recommended for those without transport, but it has a nice view. The room was very big and clean, comes with kitchen facilities except a computer in room. The Cons was I found the double bed smaller in size if compare to others. Nice small hotel located at the beach area. Rooms are well equipped for the long stay (gas, kitchen ware, refrigerator, etc.). There is quite a number of restaurants (mostly seafood) and convenience store(s?) within walking distance from the hotel. I assume this place should be a perfect base for beaching and nature wandering during the summer months. Definitely I would come there again for a longer stay.